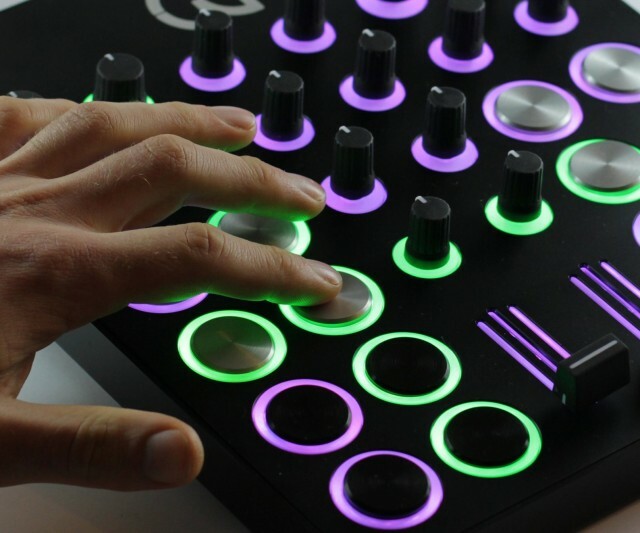 umidi – The World’s First Custom & Visual DJ Controller from umidi on Vimeo. DJs, laptop musicians, and VJs may never agree on what layout is optimal for controlling their apps. With UMIDI, they might not have to. The Kickstarter-funded project has an ambitious goal: building whatever control you want, to order. Use a graphical Web interface to select a layout, and the producer will custom-machine a case out of aluminum, etching it with your own design, and adding the controls you want. The resulting hardware is USB class-compliant and works with any software, they say, and weighs under 3 pounds in a reasonably small form factor and less than an inch thickness. For now, controls include knobs, endless encoders, faders, and an especially nice-looking aluminum push-button trigger. There’s also a textured-aluminum jog wheel for cueing and the like. Most intriguingly, though, if they reach their “stretch” funding goal, they say they’ll add drum pads. You then choose from these controls to add up to 36 on the 6×6 grid. Custom lighting shines through cuts in the faceplate, Tron-style. With 288 LEDs, you can create both effects and visual feedback. The project’s visual appearance and approach seem more than a little inspired by DJ Tech Tools, down to the sleek IKEA furniture in the background of their promo shots with controllers and records tastefully propped against the shelves. And, in turn, they use DJTT’s soft-touch caps. But with build-to-order availability of any layout, they could give DJTT a run for their money. Speaking of money, yes, this will cost you. Even the early-bird rate is roughly US$850 or 600€. But that’s a fraction of what a one-off custom controller would normally cost, it includes what appears to be some high-end components, and it ships worldwide. Shipping estimates run early spring. I think putting “the world’s first” in front of anything is probably guaranteed to make it instantly false, but they do have something novel here. The project is the work of Australians Bartosz Kowalski and Joseph Chehade.